UPDATED: Wed., Feb. 21, 2018, 4:52 p.m. This week promises many things for the Gonzaga women. It’s a chance to wrap up a convincing run to another West Coast Conference title, set the tone for the West Coast Conference Tournament, and send two seniors off in style in their final game at the Kennel. Games against San Diego on Thursday and BYU on Saturday also offer an opportunity to reflect on another remarkable year: The Zags are 22-5 overall, WCC champs for the 13th time in 14 seasons and looking for more. “We had really talented individuals, but we had to figure out a way to put them all together,” Fortier said. The Zags returned three starters – all-conference forward Jill Barta and guards Emma Stach and Laura Stockton – from last year’s squad, but they needed former backups Zykera Rice and Chandler Smith to step into bigger roles. 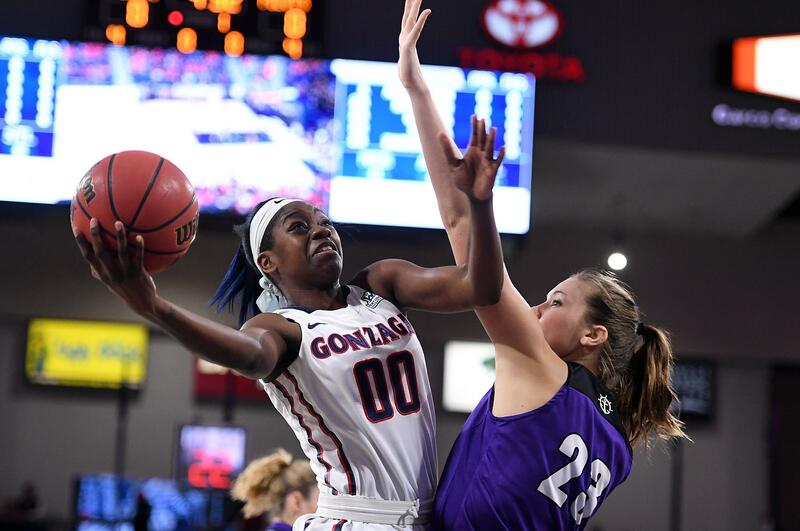 Rice became GU’s best rebounder, while Smith showed her versatility by playing almost every position on the court. As a bonus, sophomore Jessie Loera provided a spark off the bench and became a crowd favorite. “Those would have to be the biggest surprises, though they’re not really surprises to me,” Fortier said. The coaches also invested in the future with double-digit minutes for true freshmen Jill Townsend and Jenn and LeAnne Wirth. But for some players, the future is now. “We’re not done yet,” said senior guard Emma Stach, who along with post Emma Wolfram will be in her last regular-season game at the Kennel. Will it be their last home game, period? That depends on the Zags, who probably need to win the upcoming WCC Tournament to earn a berth in the NCAAs. They currently rank 48th in RPI. If they fall short in Las Vegas, the Zags would probably host a WNIT game or two, but nobody was thinking that far ahead at practice on Wednesday. “We just want to be peaking at the right time, which I think is starting to happen right now,” Fortier said. After losing at home to Saint Mary’s two weeks ago, GU completed a 9-0 WCC road season last week at Loyola Marymount and Pepperdine. That sets the stage for this weekend, facing a pair of upper-division teams that present solid threats of an upset. First up is San Diego, which is 8-8 in WCC play but coming off its first season sweep of BYU. The Toreros have three players averaging double-digit scoring, led by Aubrey Ward-El’s 16 points and Maya Hood with 12. Hood, who ranks in the career top 10 in nine major categories for USD, is the Toreros’ all-timer rebounding leader. “They’re as scrappy and pressure-filled as a team can be,” Fortier said. Published: Feb. 21, 2018, 3:17 p.m. Updated: Feb. 21, 2018, 4:52 p.m.